Silk Screen Designs and T-Shirt Designs for Silk Screen Printing by Screen Printers and T-Shirt Printers. 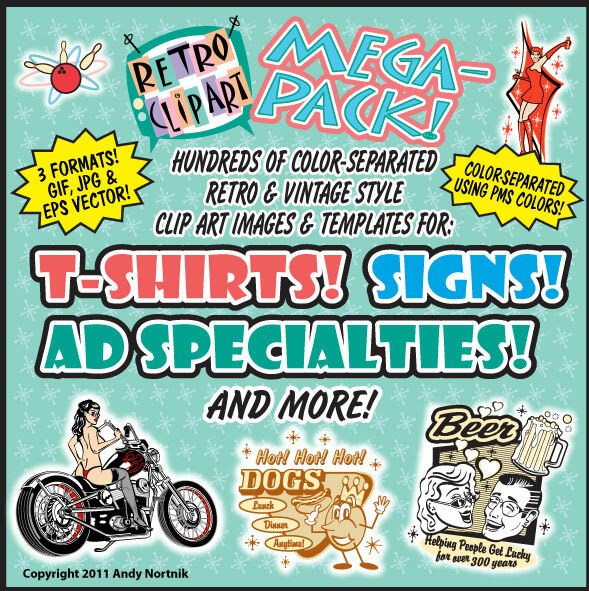 I've specifically hand-picked this collection for Screen Printers, T-Shirt Printers, Ad Specialty Companies, Sign Makers and any business who demands the highest quality and uniqueness from their clip art provider. There's nothing like it on the Internet! As a Screen Printer or T-Shirt Printer you know that high quality, color separated vector images are hard to find. As a Screen Print Clip Art Artist, I understood this dilemma, so I went straight to the drawing board and created this Mega-Pack collection especially for you! Retro and Vintage style art is making a HUGE comeback! The baby-boomers are entering retirement age and now the "X Generation", those who grew up in the 1970s, 1980s and even into the 1990s, are now leaders of industry who own their own companies and are now searching for clip art that appeals to an audience that is attracted to the vintage style artwork that was so popular in the 1940s, 1950s and 1960s. You can see the trend all around. Pop Art is everywhere! It's in advertisements, marketing campaigns, retail shops, poster shops, on apparel and the list goes on an on. Call it what you will, Rockabilly, Counter-Culture, Mod, or simply "Retro", the look is cool and trendy and now you can afford to tap into this exploding market for only pennies per image! Imagine having access to an entire library of hip and trendy graphics, designed specifically to meet your customer's needs! Well, look no further ... here's the clip art collection you've been searching for! Although every image is color-separated using the Pantone Matching System (PMS) colors, it's the perfect collection for dye sublimation and heat transfer businesses too! I've been a screen print clip art artist for years. My first job out of art school was an apprentice screen printer at a small mom and pop shop ... probably like yours! I cut my teeth on the screen printing floor, and now as a Screen Print Clip Art Designer, I know EXACTLY what you need when it comes to usable clip art that your customer will flip head over heels for! CD ROM FOR ONLY $99.99! Adobe PDF Catalog for each sub-collection so that you can find the image you want ... FAST! Clear, concisely marked folders so finding the right clip art is a snap! All clip art is on CD ROM, so in the event of that inevitable computer crash, you still have the files!